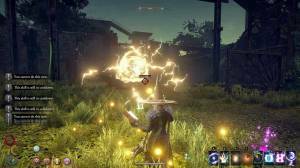 In Outward knowing how to cast magic will greatly increase your chances of survival, especially in combat where a spell combined with the swing of a sword can deal devestating damage to the enemy. Magic can also be used to heal your character, strengthen their stats, ignite a bonfire or scare the enemy. To be able to cast magical spells you first need to unlock them and although this is not difficult it does take time as it is a deliberate process in which you must combine basic spell components together in rituals. To unlock magic your character needs to gain Mana which is achieved by tapping into the Ley Line located in the depths of Conflux Mountain in the center of the Chersonese region. The mountain is in the center of the first region and you can enter it through a doorway on its southern edge. Make sure you have your best gear,lots of traps and healing items as you will encounter 10-15 enemies inside, some of which will attack in groups of 2-3. Once you have defeated them you will have reached the end of the dungeon and the Ley Line. Once fortified with Mana you can purchase spells from trainers located throughout the game. Be warned though that buying spells represents a serious investment in Silver. Listed below are the different types of magic in Outward, you will need a Lexixon to cast rune magic. Tiny fire explosion that deals negligible damage, but can be used in combination with other spells for greater effects. Can light campfires. Cast fireballs that can inflict Burning status (deals Fire damage per second for 30s) at target using equipped Torch or Lantern; casts will consume Torch/Lantern durability. Grants Warm boon to caster, increasing their Fire damage and resistance; also increases protection against cold weather. Consume 1 Fire Stone to cast a magic Fire sigil circle on ground, empowering other skills with additional effects. Grants Cool boon to caster, increasing their Frost damage and resistance; also increases protection against hot weather. Infuse your weapon with the element of Frost, allowing it inflict Slow Down status on enemies; consumes Cool Boon status. Consume 1 Cold Stone to cast a magic Ice sigil circle on ground, empowering other skills with additional effects. Note: Learning this skill will prevent you from learning Fire Affinity. In order to cast these spells in their respective areas you must find the Wind Altars that are hidden throughout each of the game's four regions. Cast a magic Wind sigil circle on ground, empowering other skills with additional effects. Enhance Impact and Attack Speed of equipped weapon for 180s. Rune magic is a specific type of magic that allows you to summon weapons and place arcane traps on the ground. To be able to cast it though requires training your character in this specialty. Training your character in a certain class of magic is done in the second region in a city called Berg where you must find Flase, the Sage trainer, and have him train you. His training is basically purchasing the four required rune spells (listed above) from him for 50 silver each. You will also need to obtain the Lexicon book and some rune magic requires you to purchase the rune upgrade from the Sage trainer, called Arcane Syntax. Rune magic is cast by tapping the runes in specific combinations (see below). Check out our Food Crafting Guide to learn how you can make meals and beverages to help keep your character healthy.